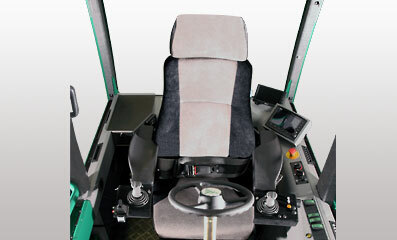 For the operator´s comfort the working place is ergonomically designed with all displays and controls within easy reach. The air-cushioned, electrically heated driver´s seat is released and locked by a gentle push of a button adjacent to the righthand boom lever. 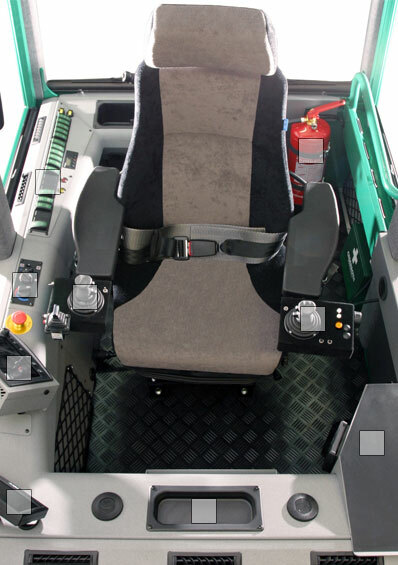 As an option the driver´s seat can be obtained with aeration, seat tilting or electrically/pneumatically adjusted side and back cushion respectively. 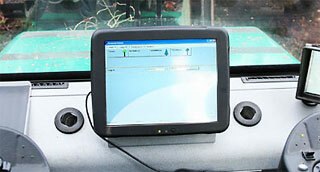 The cab is fitted with the displays for the surveilllance cameras and IQAN Experience. Further features are storage space, radio/CD player with 4 loudspeakers, rear mirror, first-aid kit, folding sun blend front, cup holder, hot cabinet and paper holder. For further information click on a square in the picture to the left. 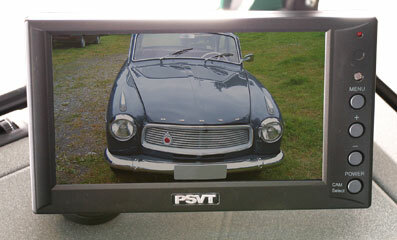 Cameras for front view (picture) and rear view with automatic change of display according to the driving direction are standard equipment. This represents an element of Gremo´s safety thinking. Another safety detail is the arrangement of having the door and the hydraulic ladder on the righthand side of the vehicle. After all we have right-hand traffic, and it is a relief not to have to leave the vehicle on the side where cars drive by. The IQAN Experience is now available with a larger and more clearly arranged colour display. Here you move in a logical and easy way from menu to menu for information and adjustment. The fine control of the boom´s movements is even more precise and five operators can select their own individual programme. For the operator´s comfort the machine is as standard supplied with an (ECC) air-conditioning plant keeping the temperature in the cab constant even on a hot summer day. 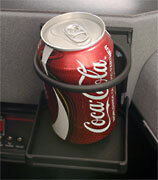 The emergency stop button is easily accessible from the driver´s seat both in front and back position. The position of the instrument panel is such that all buttons are within easy reach. 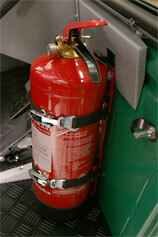 Each machine is equipped with two extinguishers, one in the cab and one on the outside. In addition a sprinkler system is providing safety for the operator. 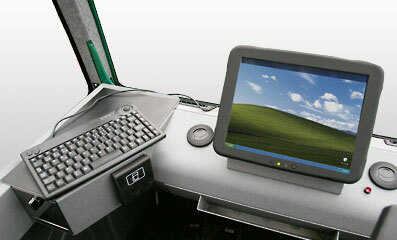 As an option the driver´s cab can be furnished with a (DASA 4) computer featuring operations follow-up, forwarder communication and GPS/GIS. Information on production and line thinning lanes covered are transferred from the harvester. Step by step the line thinning lanes covered meantime are cleared. This makes it easier to work in the dark or for the operator of the following shift. Information on production with the co-ordinates of the deposited logs are reported by mobile telephone to the supervisor. Navigation between the different menus is easily carried out direct on the touch screen or by means of the keyboard. For many operators long working days out in the forest mean no contact with the world around It is thus important that the working environment for the operators of our machines provides conditions making that the days do not feel too long. 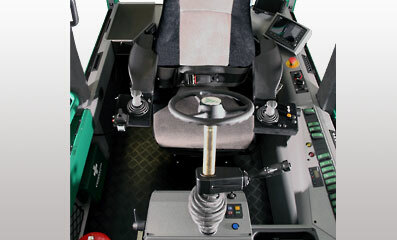 For the operator´s comfort the working place is ergonomically designed with all displays and controls within easy reach. 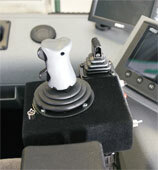 The cab offers a quiet atmosphere to keep the operator fit during a long shift. The panels and instrument panels are made of wear-resistent steel instead of plastics as normally used. Owing to this the fittings stand better up against the tough conditions prevailing in the forest. There are two ways of steering the machine in the forest or on the road: By a steering wheel folded away when you work in the forest. It makes the steering much more comfortable when you drive on the road or on long access roads.The steering torque is high to allow for fast turns even in tough terrain. Adjacent to the righthand boom lever is the lever for steering in terrain. And adjacent to that the button for the cruise control. Use it frequently, it will save your righthand leg. One of the most important things in the cab is the driver´s seat, as this is the place where the operator stays most of his working time. As standard the seat is air-cushioned and electrically heated. It is released and locked by a gentle push of a button. Standard also includes headrest and safety belt which saves the operator from having to brace against when working in tough terrain. 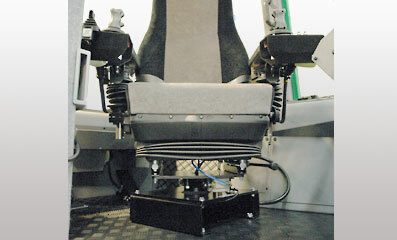 The options include seat tilting, aeration, electrically/pneumaticlly adjusted side and back cushions respectively. 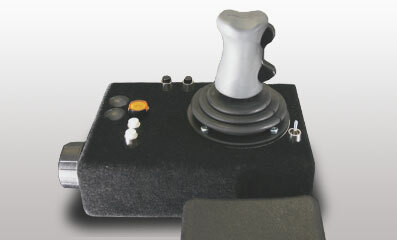 The boom is operated by the two comfortably operated ergonomically designed minilevers. The bright rocker switch operates the forward/backward movement. 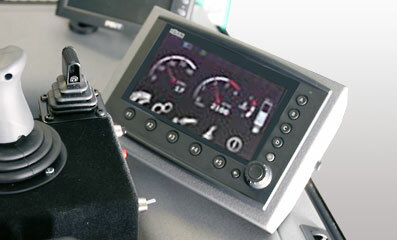 The rotary switch to the left controls the maximum speed at preset r.p.m. 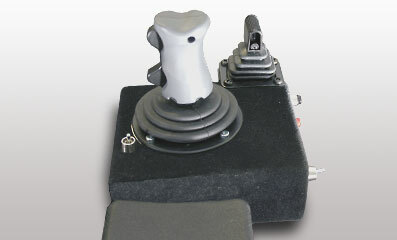 The other buttons control the differential locks, bogielift and headboard. Adjacent to the righthand minilever sits the lever for steering in terrain. 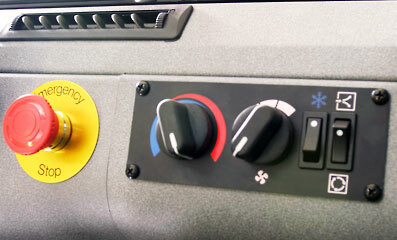 Shifting of the Powershift gearbox is operated by the bright rocker switch to the right. The buttons on the righthand side operate electrically braked seat rotation, cruise control and the touch button activates a single wipe. Naturally this applies only to the wiper facing the driver´s seat. IQAN Experience offers the possibility for five individual operating programmes.This enables every operator to establish his personal mode of working. The position of the instrument panel is such that all buttons are within easy reach, both in front and back position. 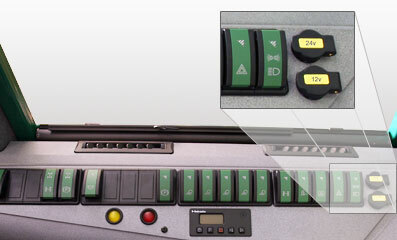 The buttons are large and easy to understand permitting simple and fast operation. For the operator´s comfort the machine is as standard supplied with an (ECC) air-conditioning plant keeping the temperature in the cab constant even on a hot summer day. 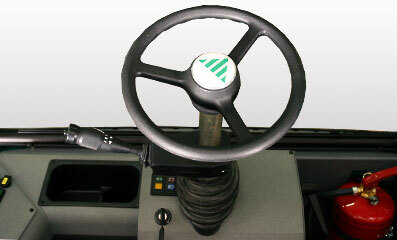 The emergency stop button is easily accessible from the driver´s seat both in front and back position. 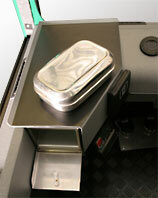 The driver´s cab features a number of storage facilities, for instance a locker in the roof panel. 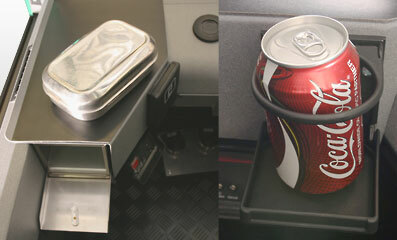 For heating meals serves a hot cabinet, and for keeping drinks a beverage holder is available. The holder for household paper is situated easily accessible adjacent to the door. All this is Gremo Standard, of course.